This assignment was to combine two movie posters of movies that have been compared to each other. 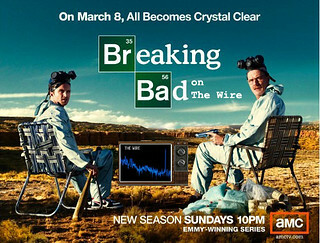 Since we’re focusing on HBO’s “The Wire” this semester, I chose to combine it with another show it has often been compared to – “Breaking Bad”. Here we have our two fellas watching “The Wire” on television while plotting their next move. It’s Breaking Bad on The Wire! This assignment was to take the original assignment “Computer Books for Kids” and remix it as a mood swap. It’s from the original Dr. Seuss story “Green Eggs and Ham” which is a journey of learning that prejudices and closed minds limit your ability to learn and experience new things. 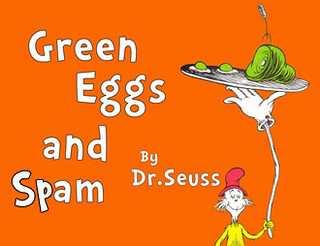 In the end, we learn that green eggs and ham are pretty good, even though they are outside the realm of one’s familiarity. Trying new things turned out to be a good option. This was a fun daily create, making a mash-up of two unrelated gaming items to create a new game. The first two game pieces I laid my hands on were an old dreidl someone gave me years ago when I went to school in Westchester, NY, and a Dungeon & Dragons character that was also gifted to me years ago.